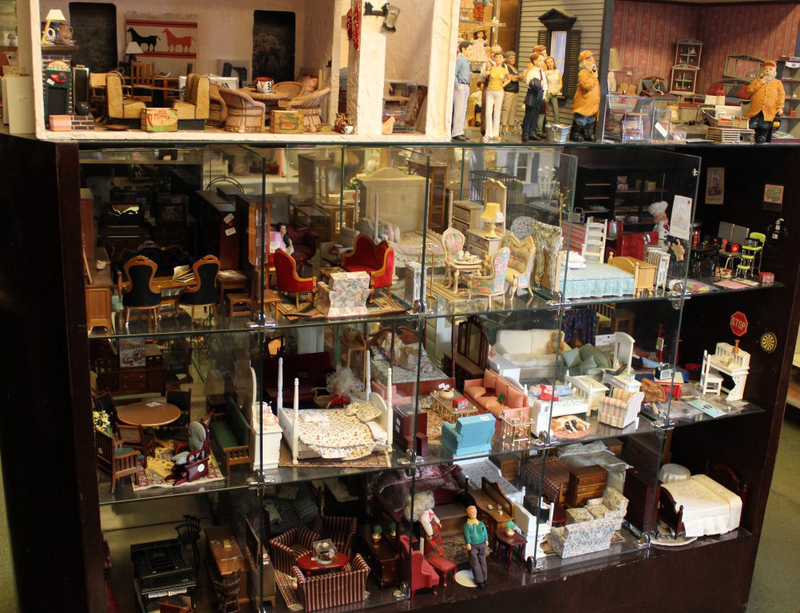 Located on a shady street in the historic district of Monument, Colorado, this charming shop offers an extensive line of high-quality miniatures and dollhouses. Monument offers a small town feeling in a growing community. Most of the shops are in individual houses that have been converted for business use and are usually run by the owner. 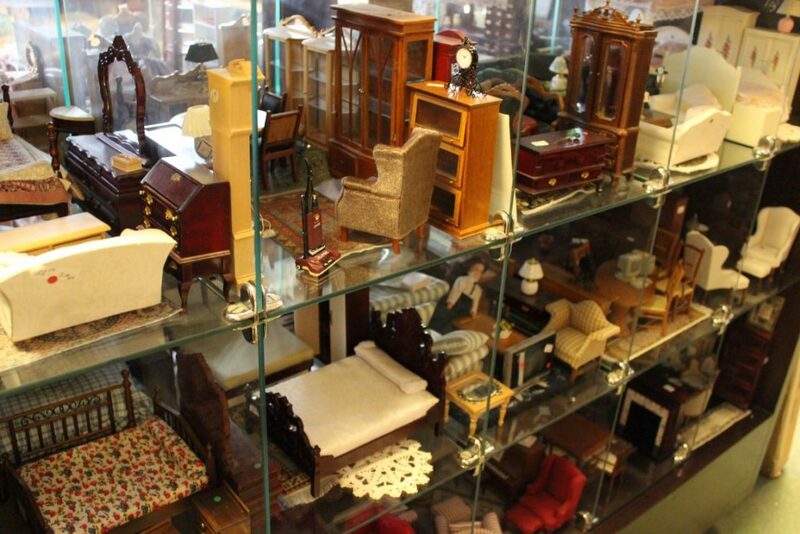 The miniatures are displayed in glass shelving boxes, each the perfect size to create a room setting. Every glass room is furnished, complete with accessories and people. Shoppers can see one complete fantasy after another, in every style and every price range. Once a child collector herself, Gayle is sensitive to the tastes and price ranges of the young collector. An entire section is dedicated to colorful, funky and durable furnishings designed to excite and inspire the beginner. Often asked if she makes miniatures herself, Gayle replies, “No, I’m not an artist myself, I am a ‘finder of artists’.” The results of her searches are evident in the merchandise she carries. Her shelves are filled with the unique, one-of-a-kind items that give a miniature setting credibility, interest, and flair. She stays in contact with the artists whose work she carries in order to make custom orders possible for the perfectionist collector. 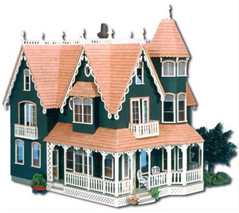 Of course, the shop also carries a wide variety of dollhouse kits as well as finished doll houses. The large selection of wallpaper and floor coverings will suit almost any taste or price range, and all the tiny details are available. Lamps, fruit, dogs, pianos, people, sewing machines, (to name a few) and almost any item you can imagine are stocked in a range of choices. Anything you need, whether or not it’s on the shelves, Gayle can find! Faithful clientele comes from as far as Cheyenne, Wyoming, Albuquerque, New Mexico, New York, N.Y. and many other states. Some even come to visit from England and New Zealand as well as other countries. Gayle has earned a great reputation for finding the perfect hard-to-find miniatures for collectors as well as the first-time miniaturist. The store offers a lot of one-of-a-kind miniatures from wonderful artists around the world. Adding a toy store in 1998 broadened the shop’s appeal and gave me a new generation of customers. 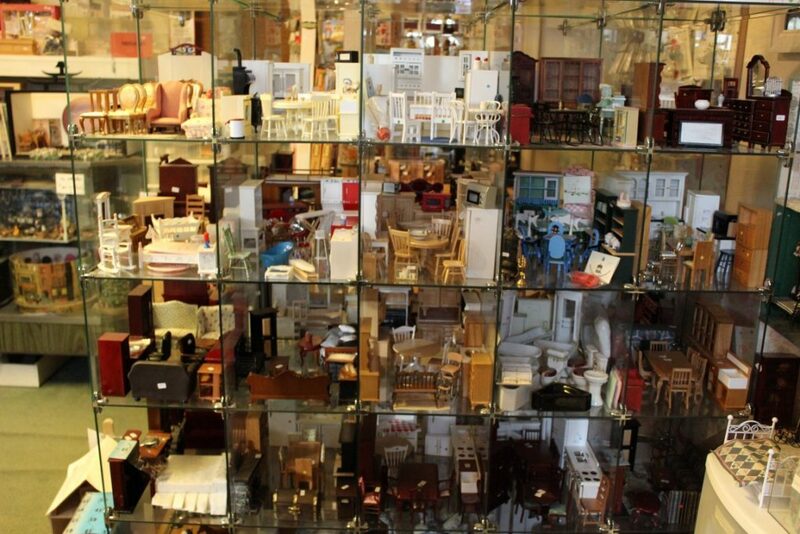 A natural outgrowth of catering to children who love dollhouses was adding on a room filled with toys. Stuffed to overflowing with unique and adorable playthings, the toy room adds a whole new dimension to the ambiance of the store. Neighborhood children love to spend time looking and dreaming and when it is time to buy, they know that they are welcome to take their time choosing just the right thing for themselves or for their friends. Every gift, however small, is gift wrapped with the care of a major purchase. 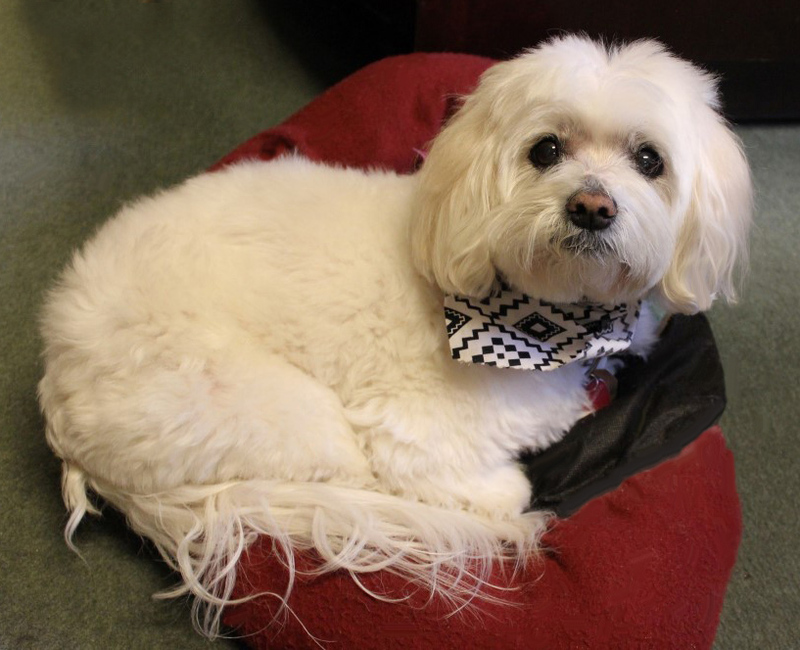 Every customer, however young, is treated with enthusiasm and courtesy. This welcoming attitude makes the store as popular with parents as with children. The only problem with spending an afternoon at Monumental Miniatures and Toys is that one afternoon may not be enough. The building appears deceptively small from the outside, but it takes quite awhile to tour the world that opens up inside the doors. Packed with treasures, the shop is well worth the trip. 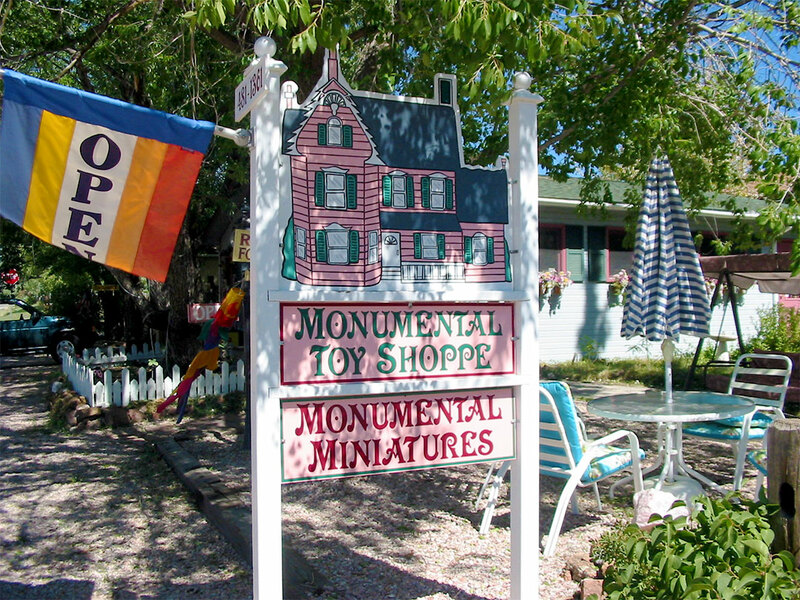 Situated in the small town of Monument, Colorado, this quaint dollhouse, miniature, and toy store is more than meets the eye. Monumental Miniatures is the size of a 2 car garage, with toys on one side and miniatures on the other. Just step inside and you will be captivated…and surprised by the volume of merchandise displayed in the shop. 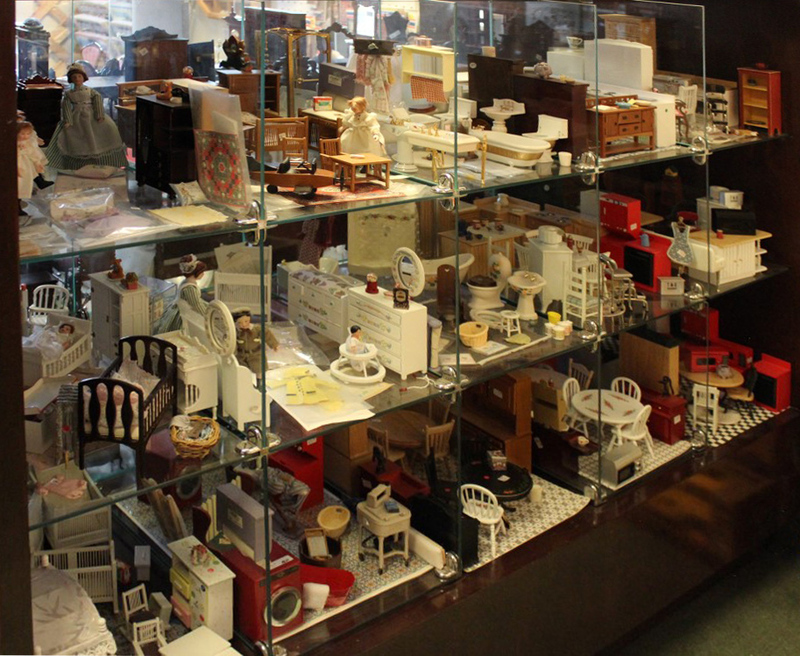 Gayle Wade, the proprietor of Monumental Miniatures, has been involved in miniatures all her life. 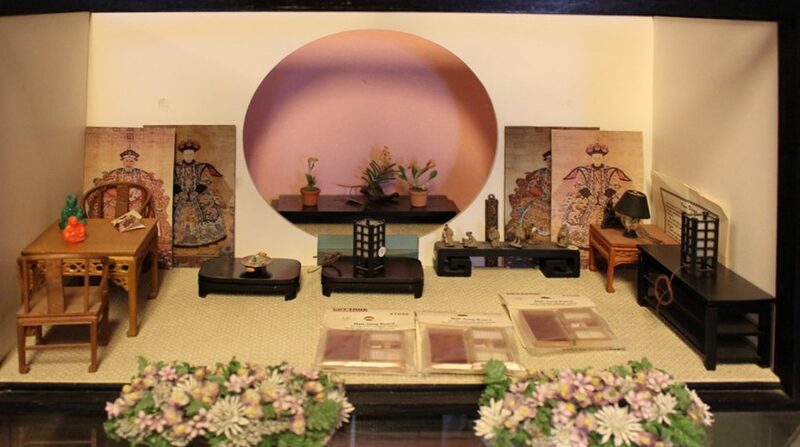 When she had the opportunity to purchase the perfect location for a shop in 1996, she turned her lifelong love of miniature collecting into a retirement career. Her business has flourished over the years and has grown as Gayle travels and expands her eclectic collection of miniatures. She says, “I am always looking for miniatures. I look for different artists and also haunt the antique stores when I am traveling.” Gayle displays most everything in her shop in open display boxes so customers can actually touch items. The open display boxes were originally men’s shirt displays from Saks Fifth Avenue. She does keep her handmade items in a case to be shown upon request. Just take a look at her website, www.monumentalminiatures.com, and you will find some of the most unique miniatures on the market. She carries some very interesting fairytale characters and the cutest little fairies. One of the more unique items is a miniature dilapidated old truck. She also carries a magical collection of circus miniatures. Gayle makes a point to stay in touch with the artisans she sells, which makes it possible for her to place custom orders for her customers. 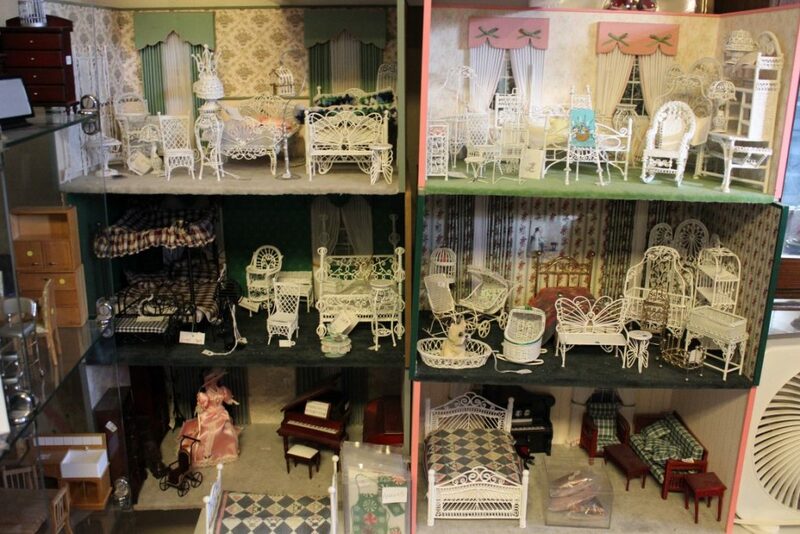 Amid all of the one-of-a-kind miniatures, you will also find dollhouses. 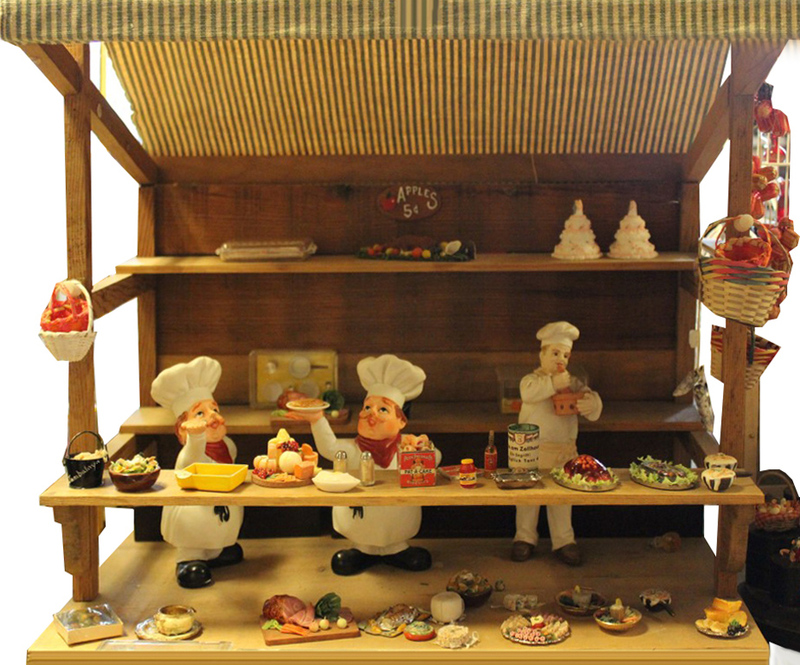 Gayle nicely displaysReal Good Toys Dollhouses in her store and on her website. Gayle says, “Only Real Good Toys in my shop! I feel I can put my reputation on their product.” She also mentions that Real Good Toys Dollhouses are the only dollhouses she has carried in her 16 years of being in business. Although you are not able to order directly from the website, she encourages you to call or fax your order. Gayle prefers to have a personal touch with each order. Even though Monument is a small community, Gayle has customers from all over the country. She also has had international customers from Germany, England, and New Zealand. Gayle has even driven and picked up folks visiting in nearby Colorado Springs to bring to her shop. Gaye confides that going that extra mile usually pays off in the end, but either way she is happy to do it. Monumental Miniatures has something for every collector, beginner or seasoned. Gayle collected miniatures as a child and knows the importance of inspiring beginners. 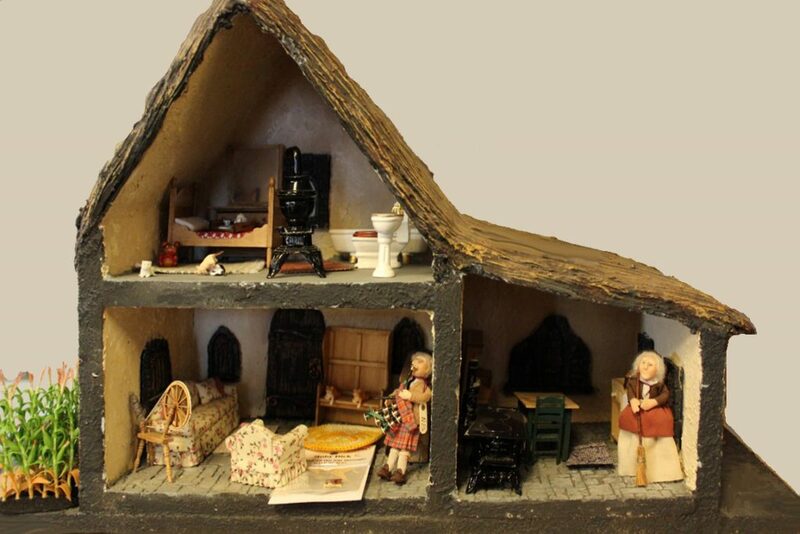 She carries miniatures and dollhouses in every style and every price range. Each customer is welcomed and treated with enthusiasm and courtesy. If you are traveling through Central Colorado, be sure to make time to visit Monumental Miniatures. The shop is located at 274 WashingtonStreet in Monument, Colorado, 80132. Their hours are Monday through Saturday 11am – 5pm. You can reach the shop by calling 719-481-1361.